This month, we come to the second round of our 15th Birthday celebrations. 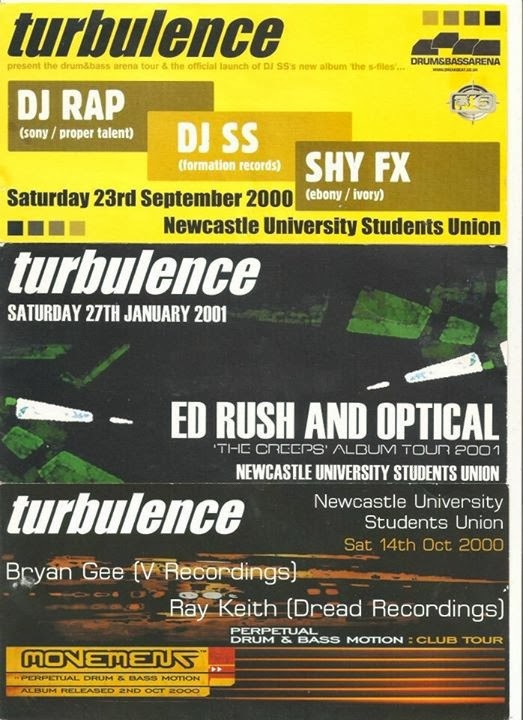 It's been a crazy 15 years of parties, providing Newcastle with the biggest and best Drum N Bass line-ups, making us one of the longest running events in the region, second only to our good house music friends over at Shindig. We have played host to most every major DNB artist, as well as supporting some amazing new talent, and provided our crowds with a standard unrivaled by our competitors. Turbulence began life way back in 1998 at Newcastle University Student Union, with resident's Phobia and Piper bringing their love of DNB and Jungle to the city, and together with host MC Mike-E-Rider, swelled in size to become the premier destination for DNB in the North. With coaches travelling from Sunderland, Darlington, Carlisle, Leeds, Edinburgh and many more towns, the Turbulence crowd was a meeting of Junglists far and wide, and united a community of people with a passion for punishing basslines and uncompromising breakbeats. 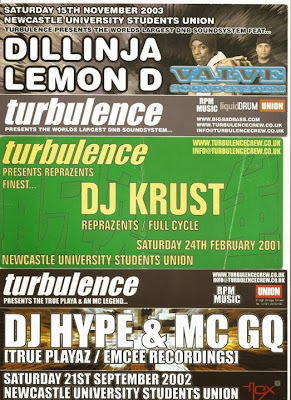 Indeed, Turbulence has always shown a deep support for the community, and local talent, with a solid and firm policy for supporting it's supporters, whether it be through local forum NCLBeats.com, in collaboration with other DNB events such as Curves, Grenade and Area51, or through the many youngsters who have cut their teeth on the decks at a Turbulence event. Our other rooms have been no different, playing host to HipHop, Breakbeats, Dubstep and House over the years, in collaboration with P-Skillz and Maroon, and the Tricky Disco boys, and more recently a solid group of local artists such as Flabski, Spectra, Nirz, Hadoshroom and more taking the reigns. We've also hosted some amazing headliners in our back room, from Skream to Skinnyman, and pushed for excellence in our smaller rooms as much as we have in our main room. 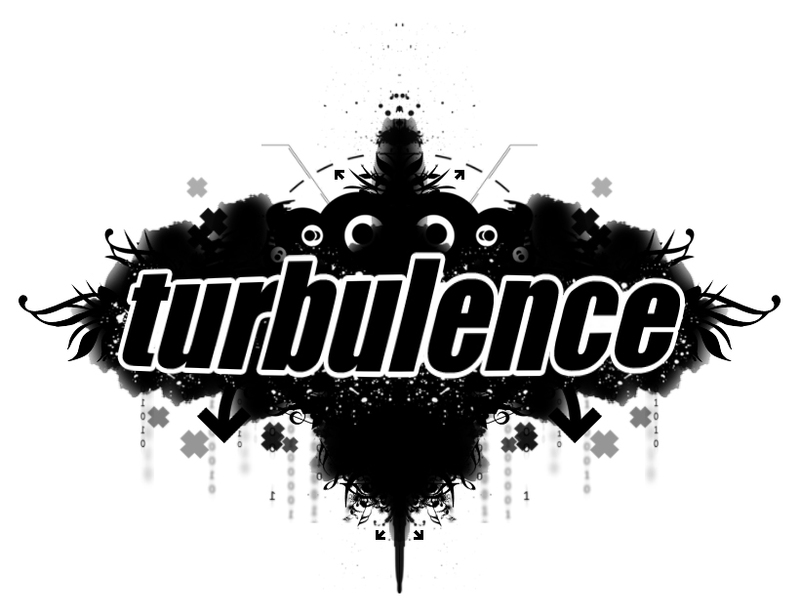 As the years have passed, Turbulence has progressed and evolved, playing host to BBC Radio 1, Drum N Bass Arena, Knowledge Magazine, 1Xtra and more, as well as showcasing labels like Valve, Renegade Hardware, Metalheadz, Ram, Full Cycle, Good Looking amongst others, and today, you would be hard pushed to find a Drum N Bass fanatic in the region who has not at some point graced our dancefloors. Today, Turbulence continues to provide the biggest and best parties at our home Digital Nightclub, and supported by our current residents Chroma and Aems MC, we regularly play host to Shogun Audio, Hospitality, Critical, UKF and more to make sure we continue to bring the best of the best to the region. So, as we end our 15th year, it seems fitting that we partner with one brand we have had a long standing and mutually respectful relationship with. 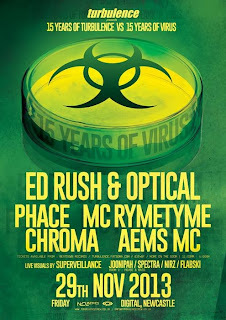 Virus Records also celebrates it's 15th Birthday this year, and having had our soundsystems graced by the mighty Ed Rush and Optical on numerous occassions throughout our history, it seems fitting that our birthday celebrations see these two true legends of the genre celebrate with us. This Friday, the 29th of November, Digital Nightclub Newcastle will resonate to the sounds of Virus and the everlasting sound of Turbulence. Out with the old and in with the new, proof that after 15 years of amazing releases, they still got it. Banger. A must have for all DnB fans, this excellent mix from Optical spans the history of revolutionary label VIRUS. Grab this and whack it on your earphones. it's ridiculously good. As we gear up for the second part of our 15th birthday celebrations, This month's headliners are also celebrating fifteen years in the game! 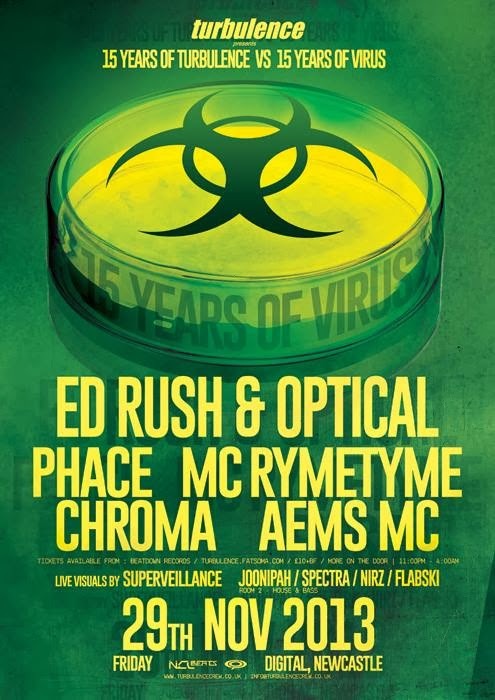 The mighty Virus Records, run by dnb legends ED RUSH and OPTICAL has been around as long as we have, and they just upped one of their classic albums to Soundcloud. Check it out. This should be in every dnb head's collection.